A couple of moths ago there was a huge scandal with celebrity photo leak which inspired me to create a new photo securing app. Since a lot of people have set automatic photos backup on the cloud, I thought there should be an app that lets users scramble those photos, while they remain being photos, so they will still be saved on the cloud. 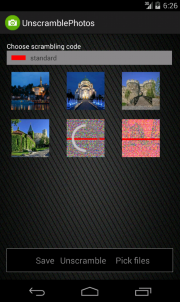 There is a camera option within the app which lets users take scrambled photos, if they are scared it might be compromised if taken with a regular camera and then scrambled. 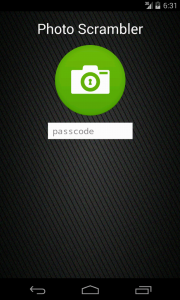 This app can also serve as a protection if you lose you smartphone or have a "nosy friend", because it's passcode protected. I used AES encryption with 256b key for scrambling, so there should be no problem when it comes to scrambled photo safety. What is the use/purpose of android app "rstech_teni"?